In Delhi, the goods were set ablaze in Sadar Bazar, which is the hub of Chinese products. Similar to Holika Dahan (burning of Holika, the devil), the traders piled up the goods and put it to fire. Traders are Chowkidars of Indian economy and henceforth the trade from China will not flourish any more, says Mr. Praveen Khandelwal, Secretary General, CAIT. 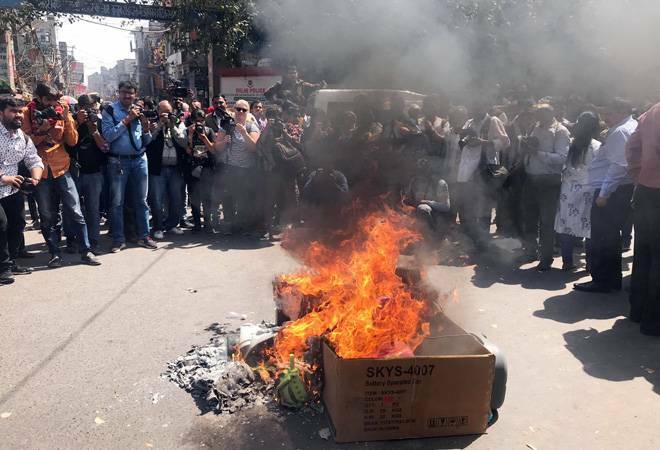 The Confederation of All India Traders (CAIT) burnt Chinese products at more than 1500 places in the country, including the national capital, ahead of Holi as a mark of protest against China's decision to block India's bid to designate Masood Azhar as a global terrorist. "Traders are Chowkidars of Indian economy and henceforth the trade from China will not be flourished any more. Whoever stands against national security of India, we will boycott goods of such country", said Mr. Praveen Khandelwal, Secretary General, CAIT. In Delhi, the goods were set ablaze in Sadar Bazar, which is the hub of Chinese products. Similar to Holika Dahan (burning of Holika, the devil), the traders piled up the goods and put it to fire. The traders shouted slogans asking China to stop helping Pakistan in carrying out terror activities in India; otherwise it can end up losing its biggest market. Mr. B.C.Bhartiya, National President, CAIT and Secretary General Mr. Khandelwal said that, "Indian traders are grossly annoyed with China who is waging a backdoor war against the interests of India by helping Pakistan in all kinds. The government should levy restrictions on trade with China". The trade leaders demanded to minimise the imports from China and asked the government to immediately impose a custom duty ranging from 300% to 500% on all imports from the second largest manufacturer. They further added that the traders union (CAIT) is launching a national-level campaign to boycott Chinese products. The campaign aims to educate the traders on how their money meant for purchasing Chinese goods is being used against national interests. A similar campaign will also be conducted to educate consumers and to urge them to stop purchasing Chinese goods. The traders body also aims to put economic pressure on China. CAIT will be joining hands with national organisations of farmers, transporters, small industries, consumers, hawkers, self help entrepreneurs, women entrepreneurs, amongst others.